In previous posts, I talked about using Gulp to manage client side builds and using Bower as a package manager for client side packages. Shane Courtrille asked me if I could do a follow up post showing how to integrate these concepts with a build hosted on Visual Studio Online. It took me some time and a long list of failures to get this working, but here it is. In order to successfully use Gulp and Bower on your build server, you will need both Node and Git installed. Luckily, the hosted Visual Studio Online build controllers already have these tools installed. If you are hosting your own build server, you will need to install node.js and Git on the server. When installing these tools, make sure you login to the server as the same user that executes the build process. Gulp requires a number of node packages to be installed. Before we can call gulp, we need to call npm install to ensure that those packages have been downloaded locally on the build controller. The easiest way to do this is to create a simple PowerShell script that is executed as a Pre Build step for our Visual Studio build. 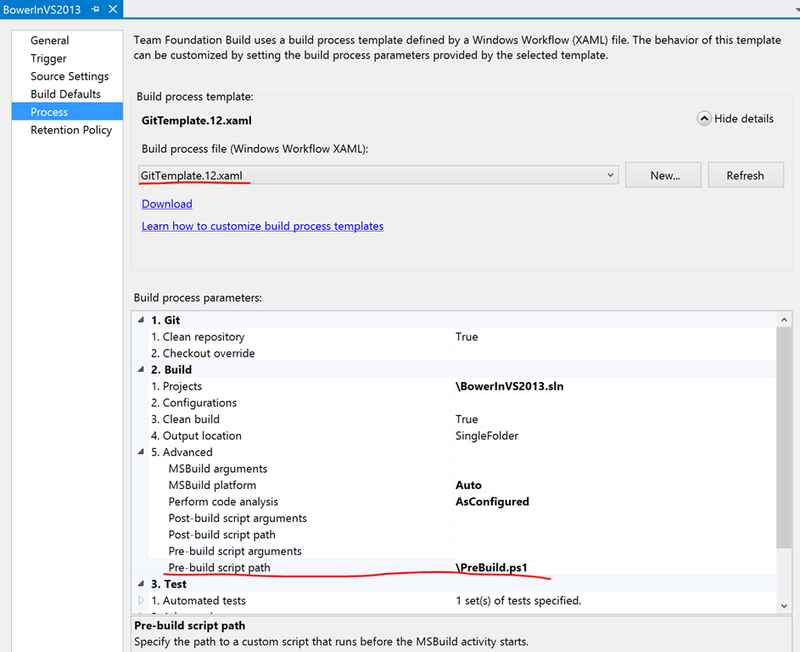 Pre Build Steps are only available if GitTemplate.12.xaml as your build process template. I added a PreBuild.ps1 script to the root folder for my solution and added that file as my Pre-build script path. In theory, that’s all we needed to do. 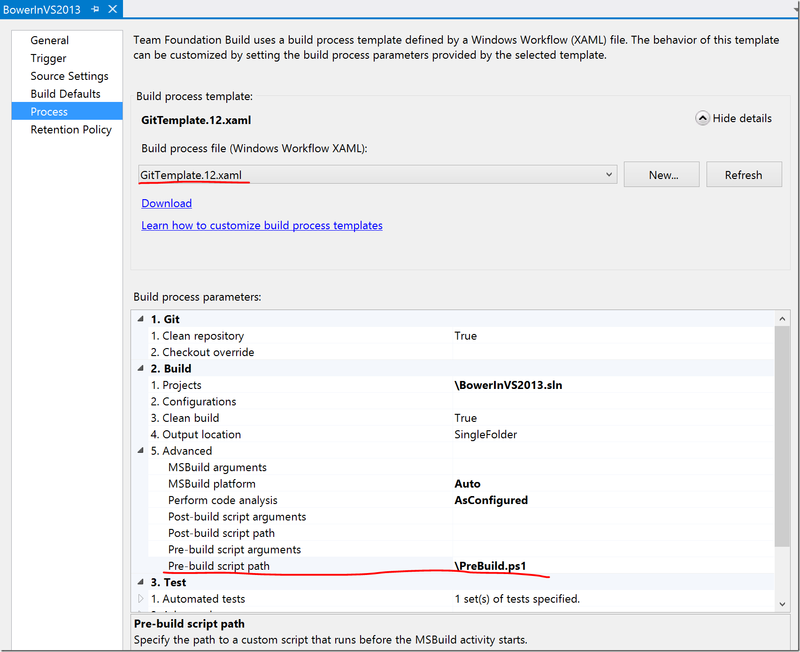 Unfortunately, theory and practice are rarely aligned…especially when working with Visual Studio builds. For some reason, the buildguests user that runs the build on Visual Studio online has trouble with the call to npm install. A quick workaround for this is to create the missing npm folder if it does not exist. $npmfolder = $appdatafolder + "\npm"
This brings us to my next failure: Gulp is not installed globally on the hosted build controller so the call to gulp default failed. To solve this I added added a gulp script to my npm package file (package.json). This gives me a convenient way to call gulp via npm. We still get one warning from npm and I’m not sure how to fix it. This warning seems to be a known issue with node on Windows and in this case it seems to be safe to ignore it. The compiled output from the build contains everything that we expect. With a few minor workarounds, we are able to get Bower and Gulp working with the Visual Studio Online hosted build controllers.